Caring for an aging sibling who is uncooperative is no easy task, but it can be done with the proper support system and plenty of patience. At-home care is an excellent option for difficult seniors who need assistance but want to maintain some of their independence. The following tips can help you provide the best possible care to your sibling. One of the best ways to make caring for your sibling as stress-free as possible is to broach the subject early on. A few months or years before your sibling requires caregiving services, have a conversation about all of the options. Bringing this subject up after a major illness or injury is almost always going to result in a heated conversation. Family members should also realize that multiple conversations might be needed before everyone comes to an agreement. 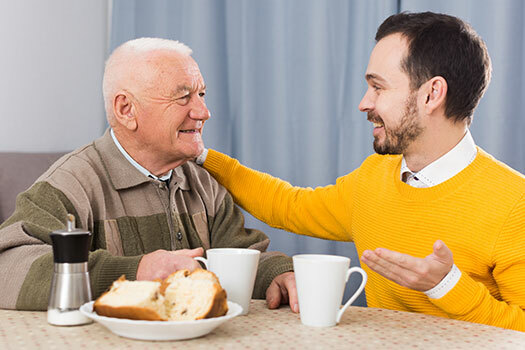 If you are the primary family caregiver for an elderly loved one and need additional assistance providing high-quality in-home care, Oshkosh Home Care Assistance can help. We are a leading home care agency committed to changing the way seniors age. Everyone has their own unique needs as they grow older, which is one of the reasons many home care agencies offer flexible services. Some seniors only need rides to and from the store, while others require constant supervision. When you bring the conversation up with your sibling, discuss how much assistance he or she is going to need and who is going to help with daily tasks. You must also revisit this conversation once every few months or whenever there are any changes to your sibling’s physical or mental health. Living with a serious health condition can make it challenging for seniors to age in place. However, they can maintain a higher quality of life with the help of professional 24-hour care. Oshkosh seniors can benefit from assistance with meal prep, bathing, transportation to the doctor’s office, medication reminders, and much more. Many seniors balk at the idea of caregiving because they feel as if they are going to lose all of their independence. Your sibling will most likely need to compromise on a few issues, but you should offer plenty of options and alternatives so he or she maintains some control. For example, ask which days your sibling would like some help instead of handing him or her a schedule. In many cases, it is easier for seniors to speak with professionals who can leave emotions out of the situation. If your sibling requires caregiving services because of health issues, he or she might need to speak with a medical specialist. Your sibling can also talk to a professional caregiver so he or she has a better idea of what to expect in the coming months. Depending on his or her beliefs, you might want to have your sibling speak with a pastor or minister as well. Caregivers who don’t work through their thoughts and emotions often experience mood swings, chronic stress, and a variety of physical ailments. There are many ways to naturally boost your mood and reduce your stress levels, including exercising, journaling, and meditating. You can also join a support group filled with other caregivers who are facing the same challenges. Hiring a professional caregiver is one of the best ways to ensure your loved one receives high-quality care at home. Oshkosh elder care experts are available to provide high-quality care to seniors on an as-needed basis. From assistance with mobility and exercise to providing transportation to the doctor’s office and social events, there are a variety of ways professional caregivers can help your aging loved one continue to live independently. To learn about our high-quality in-home care plans, give Home Care Assistance a call at (920) 710-2273 today.